Pipefitters layout, assemble, install and repair pipelines or pipe systems that carry water, steam, air or other liquids or gases for production and process systems. Gulf Coast Industries are investing billions of dollars in capital improvements throughout the Texas Gulf Coast, home to over 200 chemical plants the largest petrochemical complex in the world. COM provides training that support industry demands. The need for qualified Pipefitters in the Gulf Coast Region is anticipated to grow by 28.2 percent by 2022. The median hourly wage is $23.60 with entry level positions below that rate (Source: Workforce Solutions, 2017). The Industrial Pipefitting Program prepares students for Entry-Level careers in a high-skill, high-growth occupation. Instructors bring field experience into the classroom to provide technical and hands-on training. Classes meet two nights per week to accommodate work schedules. 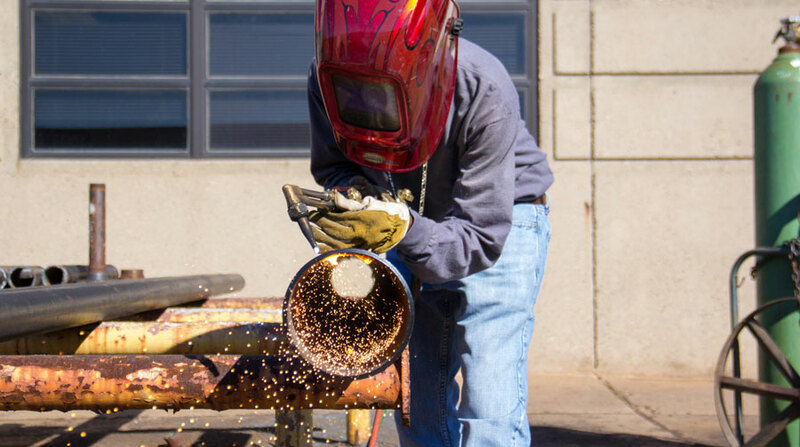 The Industrial Pipefitting Program will follow the NCCER curriculum that is recognized by leading industry, construction, maintenance, and national associations. Students who successfully complete the courses will be listed in the NCCER registry that employers access for their recruitment efforts. Students completing this program will receive an Industrial Pipefitting I and II Occupational Skills Award, NCCER and OSHA 10 credentials. This course is a comprehensive study of NCCER Core for pipefitting students. This course introduces students to basic job site construction safety in residential, commercial and industrial construction. Students will also learn how to select and demonstrate the proper use of hand tools, portable and stationary power tools, and related construction equipment. Students will obtain their OSHA 10 certification and credentials for NCCER Core. This course is a comprehensive study of NCCER Level 1 for pipefitting. Students will be introduced to the pipefitting trade. They will learn how to use hand tools and power tools associated with pipefitting; identify pipes, pipe fittings, flanges and fasteners; apply mathematical calculations applicable to pipe-fitting installations; identify equipment used in pipefitting such as oxy-fuel cutting, ladders and scaffolds and motorized equipment. Upon completion students will obtain credentials for NCCER Pipefitting Level 1. This course is a comprehensive study of NCCER Level 2 for pipefitting. Students will identify and demonstrate the use of different piping systems. They will install pipe hangers and supports, sketch isometric views of piping assemblies, interpret piping standard and specification, and use measuring devices and pipefitting trade math. Upon completion students will obtain credentials for NCCER Pipefitting Level 2. This course is a comprehensive study of NCCER Level 3 for pipefitting. The student will identify and demonstrate the safe use of construction equipment used in the pipefitting trade for installation of different piping systems. Focus will be on rigging and motorized equipment and practices. This course is a comprehensive study of NCCER Level 4 for pipefitting. The student will identify and apply advance pipe fabrication and alignment for rotating equipment. Identify, describe, apply, and/or maintain steam traps, in-line specialties, hot tap fittings and valves.